A few days ago we visited Gunchukwa, a relatively new community which was founded less than 25 years ago and as part of the recovering of indigenous land initiative has grown and expanded rapidly in the last decade. This sprout was driven by the easing of war activities in the region and the scarcity of fertile lands in other communities within the Arhuaco indigenous reserve. The office on the left and the school in the background. It takes just over an hour by all-terrain vehicle to get to Gunchukwa from Pueblo Bello which is a hub in the Sierra for travelling to many indigenous communities such as Nabusimake, Simonorua and Jewrwa. The road goes through lands owned by both Arhuacos and non-natives before crossing the Cuestaplata River and the wooden gate of Gunchukwa. The village is located right after entering the reserve on a small climb towards the south side facing the majestic mountains. We arrived at a clean and well organized settlement composed of the typical elements of an Arhuaco village, with the office for community gatherings, its respective kitchen, the house of the Semaneros, the Cooperative hut which sells some food and materials, a few community houses and the elementary school with its separate kitchen. The only missing element is the community health post which is located a further 20 minutes away by foot. We were accompanied by Laudelino Torres, an Arhuaco, dentist and head of the dental program of Wintukwa who invited us to Gunchukwa to learn about the extramural dental program and visit the health post. As tradition we first have to present ourselves to the authorities and ask for permission to visit the village, the health post and to take pictures. Most members of the community live in the surrounding mountains and up to two hours away by foot to the village. On our arrival neither the Cabildo nor the Comisario were present but it was expected that the Cabildo would come down for our visit as they were notified of our visit a week in advance. In the mean time we went to the school where we met the travelling dentist Carlos and his assistant. They travel around the reserve visiting different communities where they try to do dental work on all the members of the village, family by family. In Gunchukwa they had set up shop in the school and planned to stay for just over a month which would allow them to schedule in all the families. Laudelino explained that the health post was not in proper conditions to set up the temporary dental office so they had to use the school building instead. This meant that the kids had to move to the village office for their classes. Travelling dental office set up in the school, Carlos the dentist in blue standing in the middle. While waiting for the authorities to arrive we had a chance to chat with Carlos and Laudelino, they told us that Gunchukwa is one of the communities where dental care and hygiene is endorsed by the authorities and the Mamo which makes their work easier and more durable. This is not the case in other communities such as Donachui and Sogromin where we had observed ourselves that most if not all of the population had dental issues such as decayed and missing tooth from an early age. The lack of proper oral hygiene and self-care in some way contradicts the traditional belief that the health of the tooth depends on a person’s general behavior and diet. Through the work of some native dental health promoters, Wintukwa has been able to improve on this issue in collaboration with the authorities, the elderly and the Mamos of a handful of communities such as Gunchukwa but even so there still remains a lot of education and dental work to be done. After a cup of fresh brewed local organic coffee, Laudelino took us to the health post. During our walk he told us about his first visit to Gunchukwa five years ago when he had to spend a night in the health post, he felt a very bad energy and had nightmares. The next day he was told that when the war ravaged through this region the house was used by the paramilitary for their victims. When we entered the house we immediately felt the bad vibes and the decayed state of the building aggravated this feeling. Inside the house the rooms had small or no windows so it was quite dark but you could still distinguish the cracks and some war souvenirs on the walls. We met the health promoter Helena, who was doing some cleaning and had a brief conversation with her where she clearly expressed her dislike of the house and the need for a new health center. In the Health post talking to the Health Promoter Helena. Health post with stained and cracked walls. Health post kitchen from outside. After taking some pictures we were happy to head back to the village where we could finally meet the authorities as the Comisario had arrived instead and summoned all the representatives of the village that were present to the community office. There we were also joined by the children who were using the office as their temporary classroom. The Comisario opened the meeting before giving the word to Laudelino who explained that this would be a short gathering as the issue is well known to the entire community and has been discussed on various occasions over the last few years. Wintukwa and the community of Gunchukwa have already agreed in the past that there is a need to build a new health post and given the size of the population and its expected future growth, a proper health center which includes a dental and medical office is required. Laudelino also added that Wintukwa does have some funds available to start building the new health center but it is not nearly enough the complete the work. Health post from outside, where Helena was doing some cleaning. We were then asked to introduce ourselves, our background, foundation and intentions. After a brief introduction I recognized the issue and the need for a new center and stated that we would like to help them build a new health center. 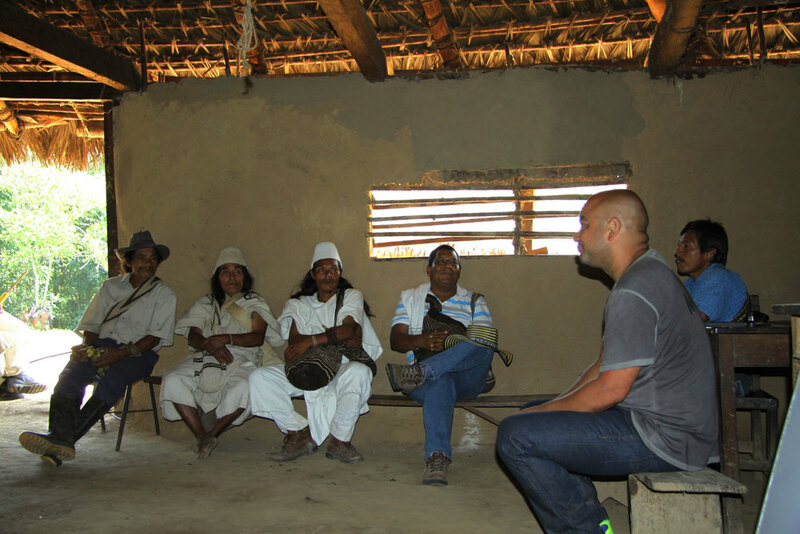 After we were introduced in Iku (Arhuaco) there was a brief discussion between them followed with a few questions for us. Their main concern was to know how much we would be helping with, to which I could only answer that we will be assisting for sure but at the moment we could not promise an amount as this did not depend on us but on some very nice people that lived very far away. After some further discussion the meeting was adjourned, we were thanked and received permission to take some pictures of the attendees before hitting the road again. Meeting with the authorities, next to Laudelino is Ivan the Comisario and to his right is Binchi the founder of Gunchukwa. The kids got a break from their lessons to listen to the meeting. Other members of the community participating in the meeting. In the Arhuaco communities the authorities refers to the Cabildo (Counselor) and the Comisario (Commissioner).